Risbo :: Do Europe in one day! How do European teachers prepare for diversity? On the 21st of June the NAOS conference titled “Do Europe in one day! 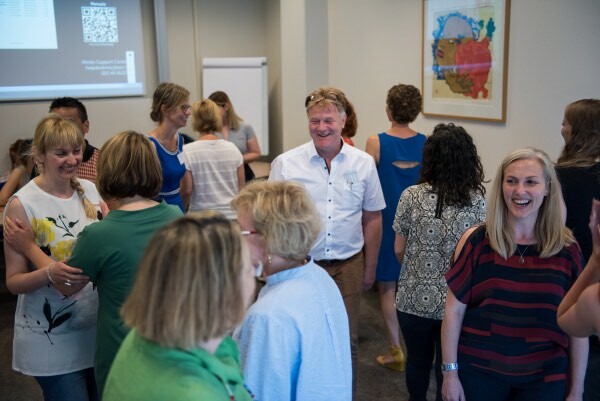 How do European teachers prepare for diversity?” took place. In the past three years, the ten partners in the Erasmus+ NAOS network have travelled across Europe visiting good teaching practices, which they presented during the conference, sharing their experiences in different interactive sessions throughout the day. During the conference, good practices from Norway, Portugal, Greece, Cyprus, Belgium, the Netherlands, Croatia, Lithuania and Estonia were presented and discussed in interactive workshops. Teachers, teacher trainers and educational staff committed to talent development in classrooms from 20 different European countries attended the conference. The conference began with an opening speech from project manager Tomislav Tudjman, where he explained the process of the project. This was followed by an overview from Prof. Dr. Sabine Severiens, who discussed the findings on teacher development in dealing with diversity, recommendations for improving initial teacher training and on professional development in schools throughout Europe. •	We distinguished five areas of expertise needed from teachers in diverse classrooms: the most attention during teacher training is given to social psychology issues, followed by pedagogy and language diversity, less attention is given to parental involvement and hardly any consideration is provided to community-school relationships. •	Some good examples were provided in social psychology, pedagogy and language diversity, whereas similar to primary education, little were available in the areas of parental involvement and school-community relationships. •	Clear commitment to diversity - diversity is not seen as a problem but as an asset. •	In some cases, diversity was not the priority, but instead emphasis was placed on educational quality, personalized learning and resilience. •	On professional development the case in one half of the schools was that learning by doing was the key practice, where committed teachers dedicated extra hours into education. •	For Teacher Training, curriculum reforms are needed. •	For professional development, the move from learning by doing to integral and evidence based professional development should be supported.